Students and staff of Coatbridge College can look forward to a brand new café bar facility. 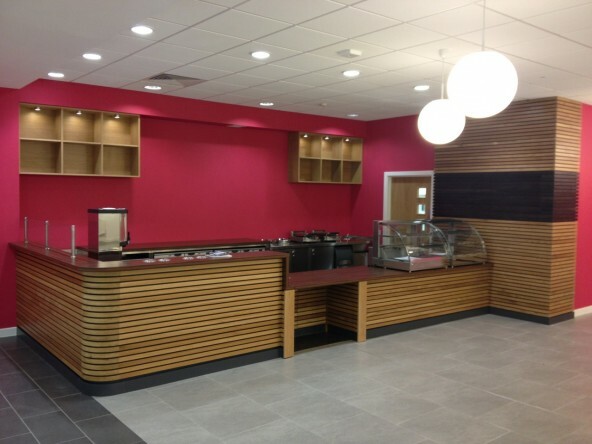 Designed by Hardies Property & Construction Consultants, who in recent years oversaw an ambitious renovation of the main campus, the new café bar continues the drive to improve facilities and make the College more user-friendly than ever. Says Commercial Director Stewart Arnott: “Our commercial fit out team stripped out the site, did the first fix work and built the kitchen area. While that was being done, our bespoke joinery team manufactured the counter top, wall cladding and main bar cladding – a mix of oak slats overlaid on painted MDF to create a striking pattern of light and shade.